With youth unemployment at record levels and graduates struggling to find work, internships – typically a period of workplace learning for undergraduates and graduates lasting from 3 to 12 months – have become an increasingly high-profile option for those finishing their university and college courses. The benefits to young people of completing an internship can be considerable in terms of learning technical or practical skills, gaining experience in an industry sector and developing their employability skills such as teamwork. In addition, employers who run internships stand to gain through bringing young people with new ideas into their organisation and building a talent pipeline for their industry, while some employers are even using internships as a way of assessing potential new recruits. 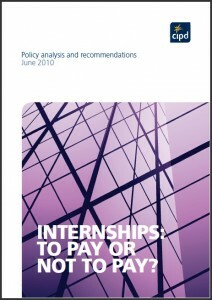 However, despite these significant benefits to young people and employers, the debate over whether internships should be paid or unpaid has yet to be resolved. 1. The existing apprenticeship minimum wage structure should be converted into a new ‘training wage’ of £2.50 an hour, which applies to all apprenticeships and internships. 2. Through guaranteeing that all interns are paid a minimum of £2.50 an hour, all unpaid internship positions should subsequently be treated as a breach of National Minimum Wage legislation. 3. To accompany the new training wage, a code of best practice for internships should be published to deliver as many high-quality opportunities for young people as possible.